While many people head to Lincoln City to get their fix of the Oregon Coast, there is another place that is just as easy to enjoy, Tolovana Beach Wayside. This Oregon State Park is located on the ocean front on the south end of Cannon Beach and offers many of the amenities that beaches in Seaside and Lincoln City offer, and many times has fewer crowds. I will be honest and say that this park has a special place in my heart, because my wife and I honeymooned in Cannon Beach, and we spent a lot of time walking up and down the sandy beaches that have an amazing view of Haystack Rock and the Tillamook Rock Lighthouse. The wayside offers many different varieties of what you want to do. On a day trip, that’s OK, with its public restroom, large parking lot and direct access to the beach, you can make the 90-minute trip from Portland to wiggle your toes in the sand or watch the big storm coming in. I know people who have decided that they wanted to walk on the beach and have dinner at Historic Moe’s restaurant – which is right next door to the park – and then head home. They leave Portland at 4:30 p.m. and are home before 10. For those looking for a longer stay, the park is a great destination if you are staying in Cannon Beach for an extended period. There are many high-quality hotels, bed-and-breakfasts and resorts in the area, and the park is a good place to get beach access and then head out for a day of shopping, exploring or just a place to leave the car while you see how far you can walk on the beach. Placed around the park are interpretive plaques that tell you about the different wildlife in the area. One is about Puffins – which nest on Haystack Rock just up the beach. Another talks about the tidepools you will find on Haystack Rock. Great reading if you are going to walk up to the rock and explore. For me, the best part about Tolovana Wayside is the stunning view. 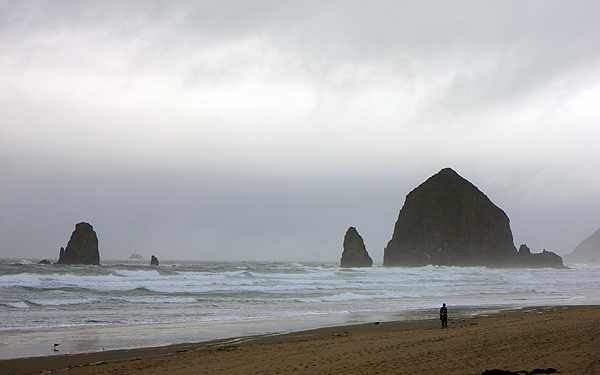 To the north there is Haystack Rock, a 235-foot rock which you can reach from the beach if you walk that direction. At low tide you can climb out to the rock and it has many tide pools and is home to many animals including starfish, crabs, and terns and puffin sea birds. If scampering around tidepools isn’t your thing, there is always breaking out the binoculars and checking out the waves crashing against the Tillamook Rock Lighthouse. The lighthouse, known as “Terrible Tilly,” is visible from the wayside and the beach. During stormy days the fog will block it out, but during high tide and when storms are blowing in, you can see some amazing views of the lighthouse being battered by the waves. The lighthouse is deactivated and it is privately owned, and only accessible by helicopter. The light is also listed in the National Register of Historic Places and it is located one and one-half mile off the Oregon Coast. While the scenery is nice, and walking on the beach is always fun, the best part about the wayside is that it is surrounded by some of Oregon’s best food. There are several local eateries that offer amazing dishes, and shopping that is probably the best on the Oregon Coast. From art galleries, candy shops and the oldest kite shop in Oregon, there is plenty to see if you visit the wayside and start to explore into Cannon Beach. If you have the kids with you, and they get bored of playing in the sand, there is also a playground at the north end of the park which is perfect for mom and dad to take in the ocean, while the kids play and burn off some of that energy. About Tolovana Beach Wayside: This state park grants visitors easy access to the beach, shopping and eateries in the Cannon Beach area, while providing all the amenities of a park that is out of town. From a big parking lot, to clean public restrooms and even a playground, this is the perfect destination for someone looking for a half-day trip to the coast from Portland. What to bring: The Oregon Coast weather changes rapidly, so making sure you layer and are dressed for the elements is important. Also bringing a good set of binoculars and a telephoto lens for your camera will also help you enjoy this beach, as it has some amazing views and wildlife in the area. Tip: Watching the tides can give you the opportunity to find treasures on the beach, especially as high tide is rolling out. Sand dollars and other shells and glass floats have been found in the area and offer a treasure-hunt aspect to your trip. Getting there: The park is listed in many GPS systems in the “attractions” or “points of interest” section. It is located at the corner of Warren Beach Road and South Hemlock Street in Cannon Beach.